Allen took the advice of his head coach and teammates to help make his decision. “I know a lot people were saying I might go in the first round, but it’s important that you listen to the right people,” said Allen. “My grade was second round. Nothing’s guaranteed, but I know the people coach (Nick) Saban is talking to and I trust him and I trust the people here at Alabama to steer me in the right direction. Despite the departures of several key players from the national title team, the Alabama front seven could be just as devastating next season with all the talented prospects the team has been able to recruit to Tuscaloosa. 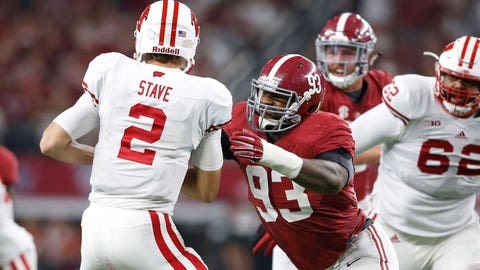 If Allen can once again lead his team in sacks, this time without A’Shawn Robinson lined up next to him, it’s hard to imagine the senior not being selected in the first round of the 2017 NFL Draft.